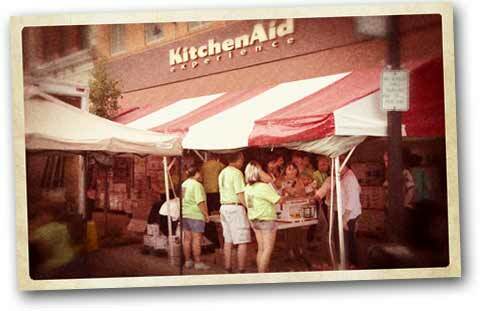 ABOVE: KitchenAid's Annual Tent Sale traditionally held the last weekend of July attracts 1000s of shoppers. Factory Tours are available. Best to call ahead to confirm schedules. Looking for a unique experience? Try visiting the KitchenAid Experience Center in Greenville. This retail store in downtown Greenville showcases KitchenAid's countertop appliances like the stand mixers that made KitchenAid famous as well as attachments, food processors, cutlery and kitchen gadgets. The KitchenAid Experience also offers a cooking school with classes from gourmet cooking to everyday meal preparation. In the lower level storeroom also features a museum with exhibits featuring old-time household appliances and of course the development of the KitchenAid Stand Mixer. One of the items on display is Julia Childs old friend, her blue KitchenAid Stand Mixer that appeared in many of her regular TV shows. 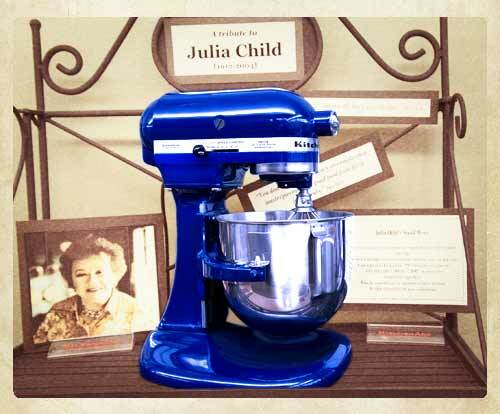 The mixer was acquired by KitchenAid in 1999 when Julia requested a new mixer for her new show "Julia and Jacques Cooking at Home". When the new mixer arrived at Julia's home, she sent her old mixer back to Greenville. ABOVE: 1924 Model "H" was the first mixer to bear the KitchenAid name. Mixer is on display at the Greenville store. In 1908 Herbert Johnson, an engineer for the Hobart Manufacturing Company, invented an electric standing mixer. His inspiration came from observing a baker mixing bread dough with a metal spoon; soon he was toying with a mechanical counterpart. 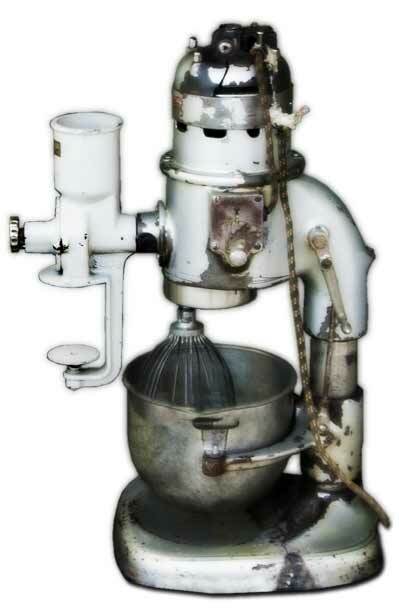 By 1915, his 80-quart mixer was standard equipment for most large bakeries. "I don't care what you call it," legend has one of the executives' spouses espousing, "all I know is it's the best kitchen aid I've ever had." The name stuck and in 1919 Hobart introduced the KitchenAid Food Preparer for the home. The first 5-quart countertop KitchenAid mixers were not cheap:$189.50, or about $2,000 in today's dollars, and they weren't light-either. Weighing in at 65 pounds, the kitchen machine weren't exactly convenient either. That changed in 1936, when pioneering industrial designer Egmont Ahrens trimmed the mixer down and reduced the price to $55. The streamline shape has changed so little that Ahrens' bullet silhouette is patented. The Model K, first introduced in 1937 as a more compact, moderately priced mixer and capable of powering all the attachments. Since then, every model introduced by KitchenAid has allowed for fully interchangeable attachments. The mixer's mechanics remain virtually unaltered, too. An attachment made in 1919, the pea shucker, will fit on today's model. Tens of millions of KitchenAid mixers have been manufactured at the same Greenville, Ohio, factory that produced the first one in 1919. The KitchenAid® stand mixer is legendary for a reason: quality construction, materials and stylish design. Find out for yourself the secrets behind the KitchenAid mystique by touring the Greenville factory plant. KitchenAid offers guided tours of the mixer factory where visitors will actually walk through the entire manufacturing process, down to the final assembly stage. There is a small charge per person for this tour. Please consult their web site for dates and times tours are available. Best to call ahead to confirm schedules.